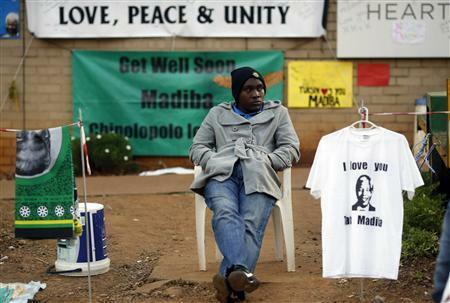 A street vendor sells t-shirts and fabric outside the hospital where ailing former President Nelson Mandela is being treated in Pretoria, July 10, 2013. (Reuters) – Former South African president and anti-apartheid hero Nelson Mandela is responding to treatment but remains in a critical but stable condition after more than a month in hospital, the office of President Jacob Zuma said on Wednesday. “We are encouraged that Madiba is responding to treatment and urge the public to continue providing support and showering him with love, which gives him and the family strength,” Zuma himself said after visiting Mandela, often referred to affectionately by his clan name Madiba, in a Pretoria hospital. Mandela, whose 95th birthday is on July 18, has been receiving treatment for a recurring lung infection that has led to four hospital stays in the past six months. A presidency statement said Zuma “found Mandela still critical but stable, and was informed by doctors that he was responding to treatment”.